We have seen how light could be described in terms of a wave, as demonstrated by the double-slit experiment. Nonetheless, that is not the whole story. For instance, in 1888, Wilhelm Hallwachs describes an experiment using a circular zinc plate mounted on an insulating stand and attached by a wire to a gold leaf electroscope, which was then charged negatively. The electroscope lost its charge very slowly. However, if the zinc plate was exposed to ultraviolet light, charge leaked away quickly. The leakage did not occur if the plate was positively charged. By 1899, J. J.Thomson established that the ultraviolet light caused electrons to be emitted, the same particles found in cathode rays: atoms in the cathode contained electrons, which were shaken and caused to vibrate by the oscillating electric field of the incident radiation. In 1902, Philipp Lenard described how the energy of the emitted photoelectrons varied with the intensity of the light: doubling the light intensity doubled the number of electrons emitted, but did not affect the energies of the emitted electrons. The more powerful oscillating field ejected more electrons, but the maximum individual energy of the ejected electrons was the same as for the weaker field. In 1905 Einstein gave proposed a way to explain these observations: He assumed that the incoming radiation should be thought of as quanta of frequency hf, with f the frequency. In photoemission, one such quantum is absorbed by one electron. If the electron is some distance into the material of the cathode, some energy will be lost as it moves towards the surface. There will always be some electrostatic cost as the electron leaves the surface, this is usually called the work function, W. The most energetic electrons emitted will be those very close to the surface, and they will leave the cathode with kinetic energy. This explanation was successful and validates the interpretation of the behaviour of light as particles. In 1921, Einstein was awarded the Nobel Prize in Physics “for his services to Theoretical Physics, and especially for his discovery of the law of the photoelectric effect”. 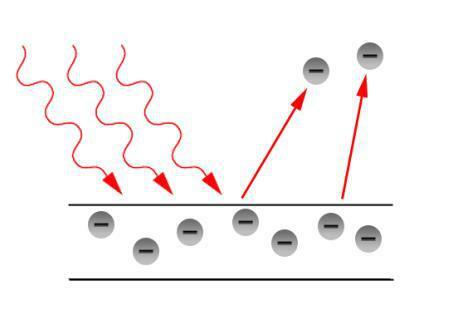 One very prominent application of the photoelectric effect is solar energy produced by photovoltaic cells. These are made of semi-conducting material which produce electricity when exposed to sunlight.